A smooth-skinned yellow potato with a great flavour. Perfect for boiling and salads. Our most popular summer planting variety, planted late summer for a second crop late harvest. All potatoes supplied are certified virus free, and come with full growing instructions. Each 1kg pack should, on average depending on variety, contain 10-15 tubers. 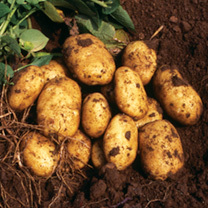 Late season (second crop) potatoes are grown from tubers which have been stored at a precise low temperature to keep them dormant until they are sent to you from June to late July. Plant them straight away (no need to 'chit' first) and they will grow away rapidly in the warm summer soil. Your first potatoes can be dug from late October, but remember to leave some in the ground undisturbed, so you can enjoy the mouth-watering, just harvested, 'new potato' taste on Christmas Day!